Since anti-LAG3 antibodies can affect treg functions and activate T effector cells, LAG3 may become a very promising target for cancer immunotherapy. Lymphocyte activation gene 3 (also known as CD223) has been shown to act as a co-inhibitory molecule expressed on activated T cells, NK cells, B cells, and plasmacytoid dendritic cells. The four IgG domains of LAG3 have high structural homology to CD4 molecules, but the homology of their amino acids is less than 20%. LAG3 contains a type of unique "extra loop" in its D1 domain located at the distal end of the membrane. 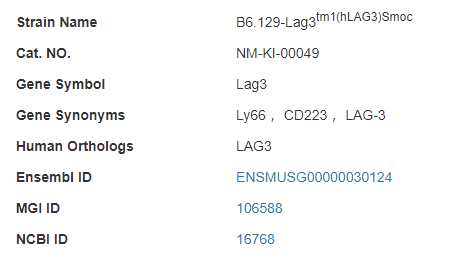 LAG3 has been shown to bind to its major ligand, MHC II, primarily through the action of the amino acids in its D1 domain. In addition, the intracellular portion of LAG3 contains a unique module (KIEELE), which is required for LAG3 to modulate T cell function. Figure 1. LAG-3 structure: LAG-3 is a transmembrane protein including four extracellular IgG domains. The intracellular domain contains a unique amino acid sequence (KIEELE) that is in need of LAG-3 to display a negative effect on T cell immune response. The membrane-distal IgG domain contains a short amino acid sequence, which is called the extra loop and not found in other IgG superfamily proteins. LAG-3 can be cleaved at the connecting peptide (CP) by metalloproteases to generate a soluble form (Goldberg M.V., 2010). LAG3 is an immune checkpoint receptor that binds to the antigen-MHC complex to present antigen to T cells. Experiments have shown that LAG3 exerts a negative regulatory effect on the proliferation and long-lasting memory of T cells. Similar to PD-1, repeated exposure to tumor antigens can continuously increase the presence and activity of LAG3. This ruthless signal gradually erodes T cells, thus causing T cell depletion so that they cannot kill tumor cells. Studies have shown that the inhibition of immune response by Tregs is associated with the activation of LAG3. In cancer, Tregs-expressing LAG3 accumulate around the tumor, thus effectively inhibiting the activity of cytotoxic T cells. 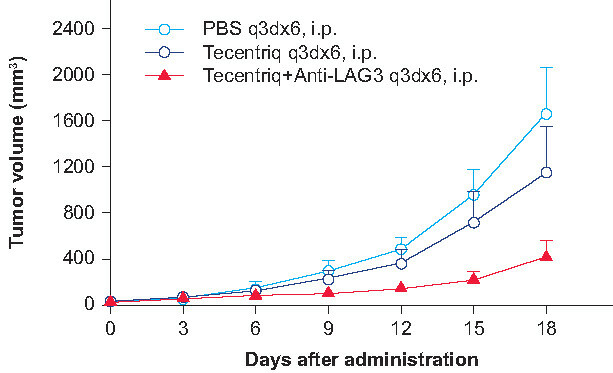 LAG3 may become a better target than PD-1 or CTLA-4 for immunotherapy, because the antibodies targeting PD-1 and CTLA-4 immune checkpoints can only activate effector T cells, but cannot inhibit Treg activity. In previous studies, antagonistic LAG-3 antibodies could activate effector T cells while inhibiting Treg activity at the same time. Since anti-LAG3 antibodies can affect treg functions and activate T effector cells, LAG3 may become a very promising target for cancer immunotherapy. The LAG3 immune checkpoint is currently being used to search for new targets for the treatment of malignant tumors and autoimmune diseases. In addition, LAG-3/PD-1 combination immunotherapy may accelerate tumor-specific responses, rather than activating non-specific or self-antigen-specific immune responses, and hence may be associated with less toxicity than CTLA-4 blockers. Several important preclinical studies have shown that LAG3 blocks the key functions of antibody drugs during cancer treatment. Shanghai Model Organisms has developed a proprietary humanized LAG3 mouse and provided a powerful model for the development of anti-LAG3 antibody drugs. Figure 2. Generation strategy of humanized LAG3 mice. Using homologous recombination, the sequence for the extracellular domain of endogenous mouse Lag3 gene was completely replaced with the human LAG3 sequence to express a humanized chimeric LAG3 protein. FACS detection of LAG3 expression in tumor infiltrating lymphocytes collected from humanized LAG3 mice. Homozygous humanized LAG3 mice were inoculated with MC38 colon cancer cells. After the tumors grew to 1000 mm3, tumor infiltrating lymphocytes were isolated and detected by FACS to measure the expression of humanized LAG3 in CD4+ and CD8+ T cells. The results showed that the active expression of humanized LAG3 was detected in the tumor infiltrating lymphocytes collected from humanized LAG3 mice. In particular, 41.1% of CD4+ positive cells were also positive for humanized LAG3. Figure 4. Expression of LAG3 in the activated spleen lymphocytes of humanized LAG3 mice is detected by FACS. Stimulated spleen lymphocytes of homozygous humanized LAG3 mice. 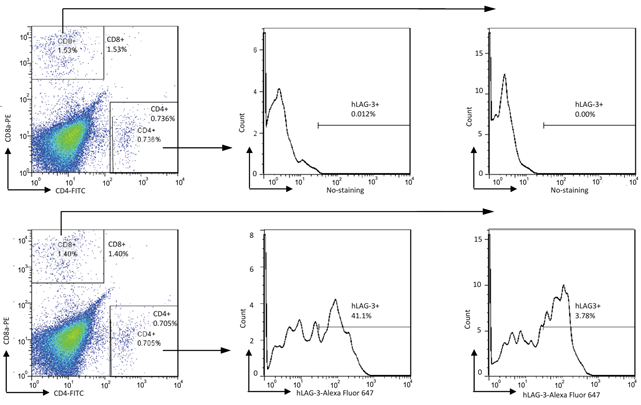 The results showed that the active expression of humanized LAG3 can be detected in both activated CD4+ and CD8+ T lymphocytes collected from homozygous humanized LAG3 mice. (Completed in collaboration with CrownBio). Figure 5. In vivo validation of anti-tumor efficacy in a MC38 tumor-bearing model of humanized LAG3 mouse. Homozygous humanized LAG3 mice were inoculated with MC38 colon cancer cell lines. After the tumors grew to 50 mm3, the animals were randomly assigned into different groups (n=5). The results showed that the anti-tumor effect was not observed when the antibody targeting human LAG3 was administered alone. 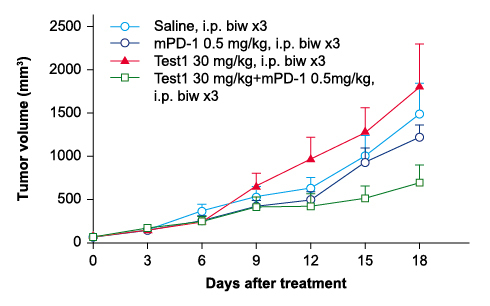 However, a significant anti-tumor effect was observed when the antibody targeting human LAG3 was administered together with the anti-PD1 antibody. Figure 6. In vivo validation of anti-tumor efficacy in a MC38 tumorbearing model of humanized LAG3 mouse. Homozygous humanized LAG3 mice were inoculated with MC38 colon cancer cell lines. After the tumors grew to 70-80 mm3, the animals were randomly assigned into different groups (n=8). The results showed a significant anti-tumor effect was observed when the antibody targeting human LAG3 was administered together with Tencentriq.